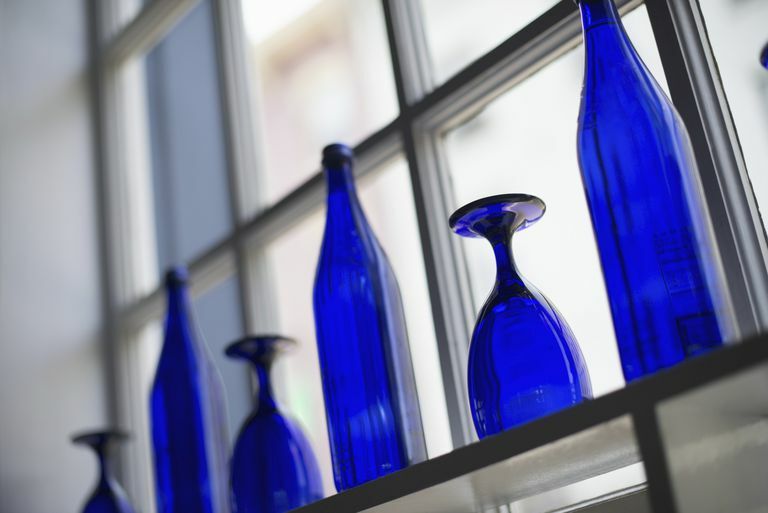 Early glass derived its color from impurities that were present when the glass was formed. For example, 'black bottle glass' was a dark brown or green glass, first produced in 17th Century England. This glass was dark due to the effects of the iron impurities in the sand used to make the glass and the sulfur from the smoke of the burning coal used to melt the glass. In addition to natural impurities, glass is colored by purposely introducing minerals or purified metal salts (pigments). Examples of popular colored glasses include ruby glass (invented in 1679, using gold chloride) and uranium glass (invented in the 1830s, glass that glows in the dark, made using uranium oxide). Sometimes it is necessary to remove unwanted color caused by impurities to make clear glass or to prepare it for coloring. Decolorizers are used to precipitate out iron and ​sulfur compounds. Manganese dioxide and cerium oxide are common decolorizers. Many special effects can be applied to glass to affect its color and overall appearance. Iridescent glass, sometimes called iris glass, is made by adding metallic compounds to the glass or by spraying the surface with stannous chloride or lead chloride and reheating it in a reducing atmosphere. Ancient glasses appear iridescent from the reflection of light off of many layers of weathering. Dichroic glass is an iridescent effect in which the glass appears to be different colors, depending on the angle from which it is viewed. This effect is caused by applying very thin layers of colloidal metals (e.g., gold or silver) to the glass. The thin layers are usually coated with clear glass to protect them from wear or oxidation.